Producing 35,600 btu., the Rika Premio is capable of heating an area of 1,500 square feet, and can burn for 47 hours without re-filling. This elegant european styled pellet stove has programmable control with different settings possible for every day of the week. This function is also available on the optional wall thermostat. There is also the option of text message control. If you are unsure of the meanings of the terms in the pellet stove review below,or their implications, please go to the Pellet Stove Reviews page for an explanation. Max. Heat Output 35,600 btu. Min. Heat Output 11,000 btu. Built in Blower The convection blower is optional for this stove in Europe and it is designed to work without one. In North America, to qualify for EPA approval, a convection fan is fitted. Convection Blower Capacity 100 cfm. Thermostat Compatible Yes, Rika's seven day programmable thermostat is available as an option. Window Size 10.5 by 7 in. Rear Vent Height 9.75 in. Five years on all steel parts except the burn pot. Two years on electrical components. Warranty extendable to five years by arrangement with Dealer. 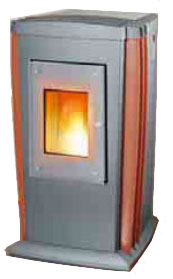 The convection blower is optional for this stove in Europe and it is designed to work without one. In North America, to qualify for EPA approval, a convection fan is fitted. A Warm Ash Vacuum will be needed for cleaning this stove. Daily: Check the burn pot, wipe the glass. Every few days: Clean the burn pot, under the burn pot, and exhaust gas channels and empty the ash pan as needed. Monthly: Clean the heat exchanger area, clean the door gaskets. Twice Yearly: Empty and clean the hopper, clean the venting system, clean the combustion fan housing.